I’m excited to share my signature “Aloha Thai Chicken Cups” recipe that is loaded with great flavors elevated by Laird Superfood ingredients delivering a healthy, quick and easy solution to menu boredom. So add an energy—sustaining element to your meals and try this delicious natural foods offering. 1. 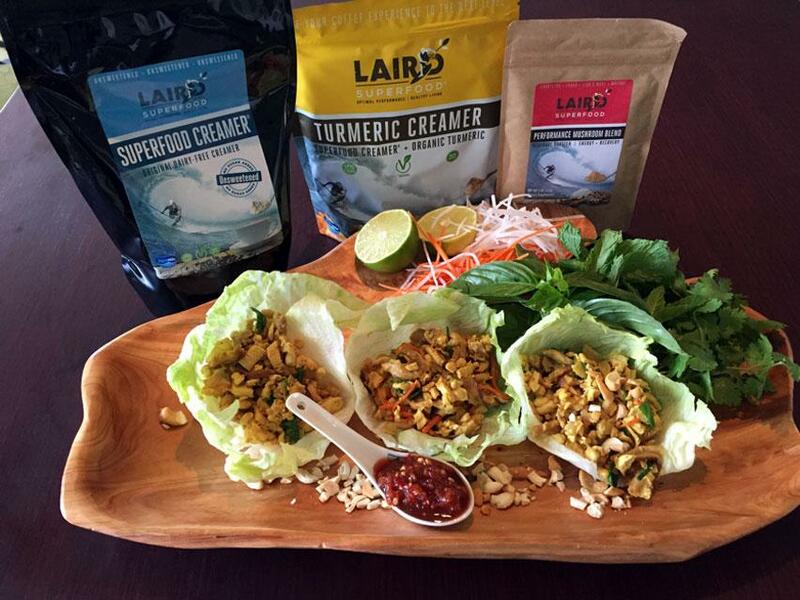 In a mixing bowl combine the Laird Superfood Creamers, water, fish sauce, tamari, sesame oil and the lime juice. Mix well and set aside. 2. Heat a pan on med-high heat. Add the Olive Oil then add the ground chicken and brown for 7minutes. 3. Remove the chicken for the pan and place on a plate. 4. Return the pan to the heat and add a 2 tbsp. oil and heat the oil add the onions, garlic, cilantro, green onions, and ginger. Stir occasionally. Add the chicken back into the pan.